Rod Abrams Funeral Home Ltd. Evelyn Jennings - Rod Abrams Funeral Home Ltd.
May we help with flowers? To order flowers, click on the links below. Longtime resident of Schomberg, Evelyn Jennings passed away on Saturday, January 26, 2019 at Stirling Heights Long Term Care in Cambridge in her 100th year. The daughter of the late Leonard and Bertha Mashinter of Bolton, she was predeceased by her husband Roy in 1996, who operated Jennings General Store in Schomberg for many years. Also predeceased by her brothers Bruce, Ken and Lorne Mashinter. Evelyn is survived by her brother Orval Mashinter and his wife Sarah of Orangeville. Loving mother of 5 daughters – Ruth (Ed) Baxter, Newcastle, Australia; Lois (Al-deceased) Gardiner, Halifax, Nova Scotia; Anne (Wayne) Taylor, Cambridge, Ontario; Gwen (David) Powell, Vancouver, British Columbia, and Beth (Gord) Brooks, London, Ontario. 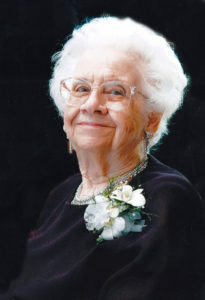 She will be missed by 11 grandchildren, 18 great-grandchildren and 3 great-great grandchildren. Evelyn graduated from Weston High School, and attended the Toronto Normal School, teaching for a short time at North Tecumseth and Caledon. After raising her family, she assisted Roy in the store for many years. Evelyn was a devoted member of St. Mary Magdalene Anglican Church, Schomberg, and was involved for many years with the Schomberg Agricultural Society Spring Fair. Our family would like to thank the staff of Stirling Heights Long Term Care, Cambridge, for their compassionate care of our mother during her stay at the home. Evelyn’s family will receive relatives and friends from 6:00pm to 8:00pm on Thursday, January 31, at Rod Abrams Funeral Home, 1666 Tottenham Road, Tottenham. The funeral service will be held on Friday, February 1 at 11:00am, at the funeral home, with visitation from 10:00 to 11:00am prior to the service. A reception will follow at the Tottenham Legion, 25 Richmond St. E.
Remember piling in with your Dad & Mom & all of you to go to Sunday School. That would make 9 of us in the car. But we were never refused a ride. Fond memories of Schomberg. Always such an elegant lady – one of my heros/mentors of the Schomberg Agricultural Fair. Roy will be so happy you have joined him. I will always remember going to the Jennings store when I was growing up. They were so friendly and welcoming. Sincere condolences to the family. Nice memories of the store and both Roy and Evelyn . There was always an elegance about her despite the huge task of raising 5 children and helping with the business. I remember going to their store in Schomberg, such a nice couple. She had a great smile that made you feel that you were always welcomed. Sorry for your loss. Great memories going to their store on main st. Roy and Evelyn were a huge part of the Schomberg community running their store and volunteering countless hours. We were blessed with them. Heartfelt condolences to the family. Our deepest sympathy in the loss of Evelyn. Great memories of your Mom and Dad at the store. (Thinking of you Lois especially) Thoughts and prayers are with you. Thinking of everyone in Schomberg and others who will deeply feel the loss of this wonderful lady. So honored to have known her. Girls, I recall fondly the many visits we paid to your parent’s general store. In 1969 I bought my first pair of new shoes from your mom for $2. You were great neighbours. Your mom will be remembered as a strong, independent woman who, with Mr. J, raised five very beautiful daughters. I am very sorry to hear of Mrs. Jennings’ passing. As said before, she and Roy were a very integral part of making Schomberg what it is today. I am proud to have worked with them at the fair. We also had great memories of the Jennings’ General Store in Schomberg, one-stop shopping, and fondly remember Evelyn and Roy. We send our sincere condolences to the family. My sincere condolences to the Jennings girls and their families. I spent about 25 years shopping in the Jennings General Store and have fond memories of both Roy and Evelyn. They were a great couple. My condolences to all the family! Thinking of you all at this sad time. A life well lived. We send our condolences to all of Evelyn’s family and have many good memories of shopping in Jennings General Store. My sincere condolence’s to Ruth,Gwen,Lois,Beth,Ann & Families sad to hear of your Mothers passing many great memories of both your Mom & Dad. She had a long life & resting now with hubby at peace. Sincere condolences to all. Your Mom was such a special Lady and I’m very sorry I cant be with you – so many memories to share of your Mom & Dad and house full of girls and all the friends! Just out of 4 months in hospital from accident and cant travel. Wish I could be with you. It was like a walk down memory lane reading all the beautiful tributes to your Mother from our childhood friends. The Jennings family was such an important part of the Schomberg Community. May her memory be a blessing to all of us. Thinking of you during this difficult time. Ruth, Lois, Ann, Gwen, Beth and families, our condolences at your mom’s passing. What a great lady. I have many happy memories of your mom & dad’s store on main street, with the friendliness and hi-jinks that went with it. We were fortunate to grow up in Schomberg surrounded with people like your mom & dad and your family. To Beth, Gwen, Ann, Lois & Ruth I send my deepest sympathies at this difficult time. I vividly remember trips to the store as well as being in your home for visits. So miss the Jennings clan once you all moved out of Schomberg. So sorry to hear about your mom. Thinking of you at this time.